Running a coworking space can be an amazing and profitable experience—you get to help people find belonging, grow their businesses, and have a good time all along the way. The trouble is that most coworking spaces fall into the trough of office space rental blues—disconnected people who just come in to put on their headphones, do their work, and go home. Trying to get people to be excited to join—and stay—can be a constant uphill battle. Fortunately, all of the challenges you might encounter have been encountered before. That’s where we come in! There are LOTS of questions to answer, more than we’d ever imagined—but with determination, some clever strategies, and the endless help of our friends and communities, we were able to get there. You can draw from all of that, AND get our help. I’ve created a toolkit and a network specifically so that you don’t have to spend time and money making mistakes and building from scratch things that I’ve already figured out. 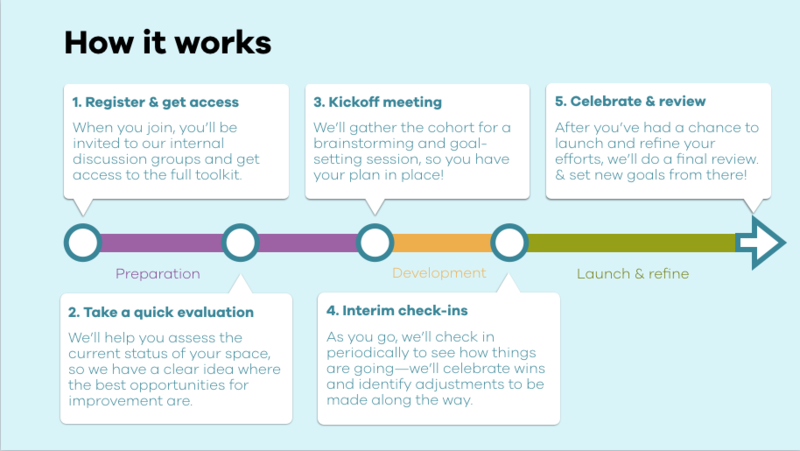 So, as you work on your space, consider joining our Collaborative Space Builders Academy. Evaluate your current situation. What is your current membership and programming situation like? What are the strengths we can build on, and the opportunities for growth we can focus on addressing? Identify where to find new potential members. Figure out exactly who you’re going to be building this for, so you don’t have to guess. Develop a programming plan. You can use our proven programs as a starting point, remix them to your heart’s content, or create your own! Refine as we go. You’ll have the chance to check in on a weekly basis to update your progress and solicit the help of the community to make adjustments going forward. Answer all of your questions. You’ll have access to both me and my network of amazing space managers. Use our toolkit! We’ve got an incredibly valuable trove of templates, worksheets, and other resources to save you time. We sell the Coworking Toolkit on its own for $399, but it’s included with your membership! All of this and much more is included in our Organizers Club membership, which is only $99/mo. This program is designed to help you get more members and keep the ones you have. At the end of the day, you’re running a business, and that means you need to make money. By joining our program, you’ll have the chance to boost your membership significantly, and in a way that will set you up to continue to grow from there for a long time. Even better? You can cancel anytime. Ready to get some more members, and have fun doing it? Let’s make it happen, together! Our next cohort will convene in early August. Register by July 27 to be included in the planning process for when that new group meets!